A week ago or so, my students' West Civ Proj blog went live. And all I can say is "wow'. I've been blogging with my kids for three or four years. In fact, my student's personal class blogs double as their notebooks as well. But this is the first time we've gone and published a public class blog. Going in, the idea was to make a magazine (as evidenced in the blog post linked to above). But, as this week has drawn out, the kids have requested that we put 100% of our energy into the class blog -- as a BLOG. I can understand their thinking. After all, the blog offers instant (as well as global) response. So far this week, blog comments have instigated discussions about quality of sources, generation gaps, and responsibility. The kids have learned that they're not always the best spellers, logicians, or copy editors; and they've also learned that there is such a thing as a legitimate audience and that people outside of their classroom actually care about what they think (and how they think). I'm very proud of the kids over our first week. And I'm interested to see where they go with it. Hope you get the chance to check out what these students -- a group of 14 and 15 year olds with no previous experience with blogging -- are doing with interactive media. As I see it, the(se) kids are alright. From Vietnam to British Columbia. From Serbia to Honduras. Teachers are pledging to go paperless for Earth Day 2010! At last count, we had about 360 teachers from around the world pledged. Here is the original call from a week ago. Here is the form through which you can pledge to go paperless. And here is the Doc listing all of the teachers who have pledged. Thank you to all of the teachers involved so far. Steve and I are thinking of ways that we can all share what we do in our classes on April 22. 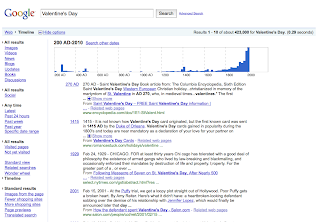 It would be great to have a site that could serve as documentation of the event worldwide. If you would like to get involved in helping to create that sort of thing, let me know. @monk51295 read my last post on post-screen futures and asks what such a future would 'look' like. While I don't think of myself as much of a science fiction writer, I can offer some suggestions that -- to me at least -- seem practical. First of all, the existing built environment would have to be retrofitted. We could start with external surfaces. Take your average city block in the downtown of your average city. The exterior of every building as well as the surface beneath your feet would be touch-interface optional and capable of projection and image grabbing. This sort of thing -- making every surface in a room an access point, for example -- is already in the pipeline. Where it gets really exciting is when it goes outside and computing becomes public as opposed to personal. When computing becomes the graffiti of urban life. However, for those times when public computing is not desired, we'll turn to our personal connection. But iPhones and the like will have gone the way of laserdiscs as they will have been replaced by glasses and satellite-connected contact lenses that offer the wearer a sensory-based personalized augmented reality experience. What both the built-environment public computing model and the sensory-based personalized augmented reality model have in common is that they are both aspects of post-sedentary computing. They change the nature of how we react to the environment and they would force us to rethink how time works in our day to day lives. In terms of schools, this would of course eliminate much of what a compartmentalized building is useful for; I see those sorts of antiquities being replaced by communally activated information and learning walls housed within smart environments and as open and physical as possible. Get rid of the desks and chairs and let the technology help get people on their feet. I'm envisioning a sort of interactive and communal digital Greek Stoa where the structure itself -- that is, the architecture and the circulation plan -- is the connection device. Would love to hear all of your thoughts on this. Let's take time out of the present for just a moment to get all 22nd century for a spell. I spend far too much time behind a computer screen. So I dream of a post-screen future. A future where the major trends in contemporary computing -- social media, the cloud, touch surfaces, interconnected telecommunication and video, and augmented reality -- meet with the built environment. As computing becomes more cloud based and less 'personal' device intensive, we're going to see a surge in smart buildings and smart environments. Surface-based interaction and AR merging with both interior and exterior interactive supergraphic architecture will ultimately replace the concept of devices themselves, let alone screens. While you might carry a small device for personal communication and connection to information, that device will only be a key to unlock the computing potential of the built environment itself. Eventually, the architecture of our built environment will itself become the access point and the built environment, infrastructure, and architecture itself will be the 'device'. The environment of life and digital access will be same thing. And we'll laugh about how we used to lead sedentary lives beholden to a screen. Just thinking about something that came up in class today. In my Latin III class, we've been talking about the rhetorical device called ekphrasis. That's a somewhat obscure method of using drama or narrative to tell the story of a picture or art work... and sometimes vice-versa. So, the day before, I'd asked the students to write short stories demonstrating abundant use of ekphrasis. Today we read the stories. And it wasn't the 'demonstration of abundant use of ekphrasis' that caught my greatest notice. It was the fact that a third of the students had written short stories that in each of which had at some point slammed Toyota. Afterwards we laughed about it and had a candid discussion and the majority of students came to the agreement that Toyotas were deathtraps. And they readily shared this opinion of the car company on their blogs, on Facebook, et al. Which got me thinking: could Toyota wind up being another casualty of the digital age? And not for any reason but that their tarnished reputation is the digitally-shared laughing-stock of the next generation of car buyers? 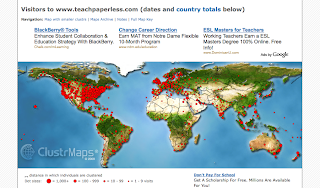 At last count (3:45PM EST), there were 275 teachers from around the world who had pledged to go paperless on Earth Day (April 22). The response to this call is something far greater than anything Steve and I had expected. A big thank you to everyone who has helped out over the last few days with the campaign on FB, Twitter, and in your schools! Click here to see the pledges so far. And click here to pledge. I've taught lots of different courses. I started out teaching English to Freshmen and then went on to teach American Lit and British Lit to Juniors and Seniors respectively. For years, I've taught Latin from the Beginner course through both of the AP offerings. In the Fine Arts, I've had the pleasure to teach AP Art History as well as my own course in Digital Audio Production. And this year, I've begun the transition into Social Studies teaching with two sections of Freshmen in West Civ. But I get the feeling that my idea of what teaching looks like just ain't what the powers that be think teaching must look like. Today in the mail, I got a postcard invitation to sign up for an AP Summer Institute. That's great. I've often found that I learn a lot -- especially from other teachers -- at these sorts of things. I haven't been to an AP institute, but I have taken part in two institutes run under the NEH and I found each to be an invigorating experience. So, it's not the idea of taking part in that sort of program that makes me feel weird. Rather, it was the picture on the front of the postcard. Now, this postcard came from Delaware, so I'm going to assume that it was mailed out to every school in the US Mid-Atlantic that offers AP programs. So, if you are in a high school in Delaware, Maryland, Eastern PA, and the surrounding area, there's a good chance there's one floating around your building. You should track it down and check it out. Because I think that the picture on this postcard demonstrates everything wrong with American education. In the center of the postcard stands a smiling teacher pointing and presumably calling on a student. Behind him hangs a map and a chalkboard. In front of him is a desk cluttered with ring binders and a book. One of the ring binders is open and it appears that this is the text from which he has been lecturing. His students are seated at desks in rows. Nothing is on their desks: no books, no laptops. Two of the students are raising their hands. The teacher is pointing to one of them. Everything about this scene -- from the roll-up map, to the blackboard, to the teacher's position in the classroom, to his desk at the front, to the ring binders, to the rows of students, to the orderliness of raising your hand to be called on -- screams of static education. Static education is the bane of my existence. Static education is the precise thing that progressive educators -- be they heavy on the tech, light on the tech, post-paper, or pro-paperback -- are fighting against. And here it is presented in all it's glory on the front of a postcard from the College Board emblazoned with the tagline: Improve your school's AP program! Hey, College Board, I've got an idea for you: can your art director / marketing person and pay a real progressive educator to take a few candid snapshots for you of what dynamic education actually looks like. A couple folks have asked what I'm planning to do for Paperless Earth Day. Here's the plan. Our school sits on a pretty big plot of land. Rolling hills, two ponds, trees. Perfect locale for teaching environmental science, actually. Anyhow, both my West Civ and Latin classes have learned about ancient attitudes concerning nature: from the Homeric fury of the sea to the pastoral visions of Horace and from civilizations' first agriculturalists learning to tame the un-tame-able to Egyptians demanding of their Pharaoh the annual flood of the Nile, the history of civilization is the history of humankind's relationship with nature. And so, we are planning to take a nature walk. And in preparation for our walk, each of our classes will be designing a 'Nature in History' wiki-scrapbook. The plan is to go out there into the great wilderness that is our campus and find bits of nature on our own grounds that lend themselves to telling the story of humankind's 'Nature Story'. Looking for metaphors in the dirt, as it were. We'll be taking digital photos of what we find and publishing our findings, thinkings, and conversation on our wikis. It's up to the kids then to do with them what they want; the day's findings might form the basis of future projects, or you might see some of the elements of our investigation on the students' West Civ Proj blog. Looking forward to hearing what all of you are planning for Paperless Earth Day. 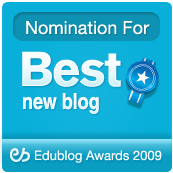 Hi-tech or Lo-tech, all ideas are welcome on Steve Katz's Paperless PD wiki. Let us know what's up in your neck of the woods. No sooner did I ask you all to check out my students' new West Civ blog than Andrew B. Watt delivers a comment that turns our student editor's argument on its head. Imagine being 15-years-old and putting your work out there for criticism and argument. And imagine receiving criticism and argument almost immediately from some source -- some real person -- beyond the walls of your classroom. Imagine having to think about that and deal with it. And having to do all that in a public sphere. This is what learning looks like in the 21st century. I was talking to @schickbob about it earlier, and he nailed it: "The learning starts when commenters start disagreeing with them". Authentic experiences. Real blogging. Authentic learning. In public. And learning that you've got to back up what you say and that there's more than one angle to every story. We can't just pat kids on the head for making a blog. If we do that, we're gonna end up just as inauthentic as the teachers who patted us on the head for writing crappy poetry and putting together cookie-cutter science fair tri-folds. Rather, we've got to use blogs and the connection to the world that the Internet provides to engage our students in real ways to live up to the potential of their convictions while likewise having the humility and sense of civility to provide a forum for discourse. Thanks to all of you who have supported us along the way to initiating this project and thanks to those of you today who commented on the posts. We plan to post often and we've got some surprises in store as well. Our tagline is: "Because history just ain't what it used to be". But it might as well be: "Because the history classroom just ain't what it used to be". My 9th graders are very excited. Today, our student written-and-edited history blog went live on WordPress. The e-zine component (on issuu.com) should come out on Friday. I'd really appreciate it if you all would stop by the new blog and give the kids some high-five comments. This is their first endeavor doing anything like this, and I can only imagine how far a little beyond-the-classroom-walls encouragement would go. We're also looking to collaborate with other classes, please be in touch if you are interested! We now have over 100 teachers who have taken the pledge to go Paperless for Earth Day (April 22)! Read the original explanation of what we're doing and why we're doing it, then surf over to our Google Doc and pledge to go paperless! As of last check, over 50 teachers had signed the pledge to go paperless for Earth Day! Here's a link to the post explaining what we're doing and here's a link to the pledge itself. Note that we're organizing the list in alphabetical order by school. That gives us the chance to easily see which schools have the highest participation! Thanks to everybody who's signed up so far. And please continue to spread the word in your schools and on Twitter. Hey PLN! Got a question for you. @schickbob is looking for an app that maps Twitter followers sort of like ClustrMaps does for folks who drop by your webpage. I've tried foller.me and the Yahoo Pipes maps, but found the first far too clunky and the latter limited in its usage to only 100 followers. I'm looking for something more substantial. And so my question is: Do you use or know of any quality Twitter map services? How do we support the changing role of teacher? What does and educated person look like today? This is an interesting list and it especially interests me in terms of a common thread through the questions, namely: the intersection of identity and purpose. The first two questions clearly have to do with the identity of a teacher. What is it that a teacher "does"? And how has what a teacher "does" changed/is-changing? Historically, we might say that teachers generally "do" three things. They impart wisdom and offer systems of understanding -- I'm thinking Plato and Aristotle as well as the Classical Raga gurus. They also serve society by preparing citizens for the demands that work and service will put on them -- here we have the teacher of "skills" whether we talk about the Medieval Guild system or elements of contemporary public education. Third, we have teachers as the generational constituents of the transmission of ideas, arguments, and concepts -- and here I see the Rabbinical tradition as a rich example. As for the question of how to support the change that teachers are going through, I'd first suggest we define the change itself. More often then not, education finds itself in the position of responding to rather than initiating cultural change. This makes sense, given that so much of what we do in education is in using historical precedent to help students develop ways of knowing. All the more important then that in this era of rapid change, we should not forget that our educational predecessors have long grappled with societal paradigm shifts. In fact, I would make the argument that a rather good way to consider the questions raised by the Weblogg-ed readers is through the lens of historical analysis. For these are important questions; they are questions dealing with the fundamentals of identity within an era of dramatic shift. And for that reason, we should look back into dramatic shifts in history and examine how -- or whether -- education itself rode out those storms. Over the next few months, I will be examining the historical nature of shift and the way in which education has responded to it (or how it has occasionally shaped it). I started generating a list of ideas this morning, and have already found some interesting parallels. For instance, at the same time that the experiment in democracy is occurring in 5th century Athens, the leading ethical philosophers of the age are making arguments against what had become a tradition of hawking educational ideas and rhetorical constructs for cash in the Stoa. Later during the Roman Empire, education becomes a commodity somewhat reflecting imperial values as well as turning certain locales into what we might call the first "college towns". In the wake of the decentralization of Roman governmental authority in the early Middle Ages, education becomes (literally) cloistered in the abbeys; five hundred or so years later, the universities arise with Latin as the lingua franca and a new class of intellectual elites that even later, with the rise of dialectical theory, will begin the movement towards educational celebrity as professors become seemingly as important as their disciplines and education again becomes peripatetic. In the Renaissance, we will see the further societal split in the intellectual tradition with the Guilds taking the arts and the private tutors of rich aristocrats taking the humanities. All this leads into the greatest pre-Industrial shift since the Agricultural Revolution -- the development of the printing press and the rise of the literate masses. In short, the history of education is a history of responses to cultural shift. Which means that the history of teachers is a history of responses to shifting demands upon identity. How did the identity of teachers change through each of these shifts? Is it too much to think that our own era of digital shift is not something new, but rather the next phase in an ongoing process of historical dialectic? Is it even worth it to think in these terms? Or should we be focusing on the day-to-day work of "changing" schools? Well, in my thinking, the questions raised by the readers hit on big themes: identity, passion, essentiality, purpose, adaptation, environment, and exclusivity. If I can play one small role in this conversation, I'd like to be the historian. I'd like to help give context to each of those big issues from an historical perspective, not in that the history itself will necessarily change what's going on in the day-to-day, but in that closer examination of the history might help us think about how we are answering the questions. Many of us in education -- myself included -- tend to be pragmatists; we work with what we've got, and for the most part theory and history are often a diversion rather than a primary function within our practice. We talk about practice and policy in the story of "now" and we work scrappily to make things happen in the "now". And that's fine. But it leaves me personally feeling that the work of education all too often is forced to exist within the confines of politics and finances rather than in the sphere of the re-enchantment of the spirit where it belongs. And for that reason, I'm very excited to be one small part of this broader conversation on the "important" questions -- as well as the importance of having questions -- that the sphere of educators revolving around the new digital paradigm brings to the debate. And I'm happy to put on my historian hat and I invite anyone interested in looking at the historical currents arisen by these themes to get in touch; let's think together and write together. Do our small part to help create a substantial context for the discussion. Posted an article over on Richard Byrne's blog today concerning one of my absolute favorite text-book killers: the Heilbrunn Timeline of Art History at the Metropolitan Museum of Art. Skip on over there and hone in on your inner Art Historian. And if you haven't yet, do take a moment to subscribe to Richard's blog. 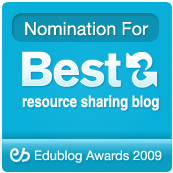 It's easily the best daily classroom/tech-integrating resource-sharing blog on the Web. @SenorG is doing great stuff with iPod Touches in his Spanish classroom! Here's a recent television report on what a social-tech-integrated learning experience can look like. Here's a screen clipping of our community via ClustrMaps. Showed this to my students to demonstrate what we mean when we say "global". Makes for a simple, yet effective demonstration to admins and faculty as well. Just wanted to say thanks to all of you (even those of you who've just passed through once or twice) for all you do as professional educators and serious learners. My colleague @schickbob set up a nice little snowday exercise. 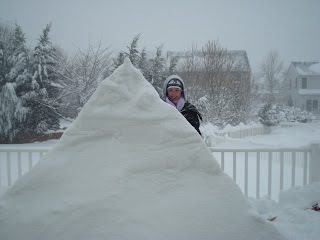 The assignment: Build a snow pyramid bigger than you, and get some extra credit. Get the media to cover it, and receive even more. ...which the student ran through the social media platform on one of our local television network's websites and which thereby got picked up as a local interest story by her local newspaper. Go figure. Learning how to get media coverage: just another thing to do on a snowday. So, we've gotten hit by two blizzards in five days here on the East Coast. We seem to never be ready for this kind of weather (not counting the kids who keep plastic toboggans at the ready, just in case). And so, inevitably, we wind up with snowdays. This year, our administration asked teachers to try and prepare for situations where we could lead our classes even if school were shut down for a spell. The thinking at the time had to do with Swine Flu. I was actually quite excited about the prospect of teaching online. Last summer, I used Elluminate to give a presentation on Twitter in the Classroom in the 'Unplugged' sessions at NECC; I'd also used Wiziq to demo online teaching strategies to my grad students at JHU. Now, the snow had given me my first chance to try out online teaching in a real way with high school students. We chose Wiziq as our interface, and, over the course of a bit more than a half-hour, the students in my West Civ class had brainstormed, debated, and put together a fantastic set of questions for further investigation. I ran myself via video feed and each of them had access to speak, share on the communal desktop, and chat in the backchannel. Excellent results. If you and your students have access, there's no reason why this sort of platform couldn't replace the role of traditional homework (think a fifteen-minute review and extension quick-lesson each eve after dinner). In addition, these tools can just as well be used live in the classroom. In fact I'm looking forward to getting back to school (looks like we're off 'til next Tuesday) to investigate bringing aspects of the online classroom into the f2f classroom. I see so many possibilities to use online learning styles merged with face-to-face communication and real live group dynamics. Until then, don't fret about snowdays being days when learning and classroom camaraderie have to cease; rather use connectivity to your advantage. Thanks to @reportertanya for her Converge magazine piece today on teaching in a tech integrated classroom. Her piece features some of the things that we do in our classroom (and there's a cool pic of our work-studio space, including the Sgt. Pepper gatefold on the wall next to the clock). We had a good chat a week or so back about what it looks like on the ground to be working in a fully tech integrated classroom and one of the things I think she nails is the idea that tech integration has to (and will) become casual, obvious, and necessary. 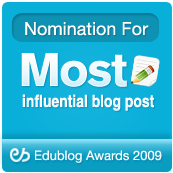 Shelly, this is a great idea and is one that I'll work to get my students to contribute to. Do you have any criteria for how the questions should be formulated (e.g. they must begin with "how" or "why"), the topics they should deal with, or the genre of historical question they should be (e.g. change over time or compare-contast)? For those of you interested in taking part in the project, our wiki is now live. The type/format/gist of the questions are completely up to the creator of the question. The only thing I ask is that you consider (and I use that verb for specific reasons) that your audience is a class of high school Freshmen. Weekly topics are typed in bold on the wiki at the start of each week's unit. Under the topic of the week is an essential question that each student will respond to as a weekly article. Under the weekly question is a list of daily questions -- these are the crowdsourced questions. Individually, students choose four dailies each week and blog on them. Then, we'll go back discuss and post to our magazine (still under construction) the best of the responses to the dailies in an effort to start a broader discussion online and beyond the limits of our classroom walls. I've set up the wiki so that anyone can post questions. While I monitor all incoming edits, I trust our community to engage in a meaningful way with the wiki and I encourage folks to change things up and use the wiki as a starting point for your own discussions as well; already we've had three or four classrooms from other schools get in touch about sharing ideas and collaborating. Post your questions directly to the wiki (I may edit them lightly or shift them to different parts of the wiki depending on what we're focusing on in class, but your questions will stand). As always online, I encourage folks to leave their real names and links both to demonstrate who they are and to encourage students to understand that learning is not merely a 'classroom-based' activity, but rather questions and ideas and learning come from engaging with the questions and ideas and learning of 'real people'. Thanks to everyone who has shown interest in this project. I look forward to seeing where it goes. Been getting a bit antsy. Homebound under 32 inches of snow. Schools closed. Shops closed. Streets closed. I realize that folks in Alberta would snicker at our plight, but here on the Chesapeake we just don't get this kind of weather all that often. And so when we do, it all shuts down. I've been thinking about how folks in the snowy areas of the world handle this sort of thing. Thinking about why three feet of snow doesn't mean a whole lot to folks in Buffalo; how Edmonton manages to go about its work at -30 degrees; how folks in Nepal have a whole other appreciation for snow accumulation. And it's really just a matter of expectations. And I think there's something to be learned there. Though I so often specifically talk about how social technology is not monolithic, I realize that I often talk about social media in monolithic terms. It's too easy to see my own situation as the 'way things are'; and I think we all have a tendency to do this. As we move forward in this discussion, I want to hear more of the stories from the folks on all sides and in all sorts of situations. Because the worst thing a blogger can fate a blog to is a regiment of closed expectations. I look at my ClusterMap and I see hits from folks all over the world. And I can not pretend to understand what all of you are going through in your own story of education. So tell me. Tell us. I'm hereby asking folks who live outside the US to please get in touch about guest blogging here on TeachPaperless and helping us understand what education is where you are. Just leave a comment to this post and I'll be in touch. The Freshmen in my West Civ class are crowdsourcing questions and ideas for their daily blog posts. Check out westcivproj.wikispaces.com and leave a 'daily' or two. We'd especially like questions from your students! Join the TeachPaperless Facebook Group, meet other teachers, and take part in the conversation! I take occasional polls of my students to gauge where their feelings are on a variety of issues. So, last year I had taken a poll asking which browser they liked best. 80% reported using Internet Explorer and 20% used Firefox. Took the same poll this week. The results: 1% Internet Explorer, 4% Firefox, 95% Google Chrome. It was nice to talk to Kathleen Manzo about student blogging and personalized learning; her piece on 'Digital Tools Expand Options for Personalized Learning' in Ed Week popped up on the Net the other day and comes out in print tomorrow. For educators who struggle to integrate technology into their daily routines and strategies, the notion of a kind of individualized education plan for every student is more pipe dream than prospect. Yet the most optimistic promoters of digital learning say the vision of a tech-immersed classroom for today’s students—one that offers a flexible and dynamic working environment with a range of computer-based and face-to-face learning options customized for each student—is not far off. Reading the piece, I'm very interested in the progress of students at New York City's School of One. Especially because much of the focus there is on tech-individuated math learning. But the success or failure of tech integration in education isn't going to be determined by the success or failure of the School of One. And it isn't going to be determined by whether textbook publishers are going to be able to make the shift to digital. Or by whether any particular venture capital firm supports education. Rather, tech integration is a part of a cultural shift. It's becoming, and soon will be, something expected and necessary. Teachers already tapping into the great free resources of the Internet and Web 2.0 already know this. And so, I humbly submit that if we really want to bring meaningful tech integration and digital empowerment to every classroom, we can't do it by courting Big Tech and Big Textbook. We have to do it by demanding laws and statutes that ensure free universal Internet access and coverage for all. Access as a Civil Right. That's the key to personalized learning. I've noticed a lot of new readers showing up at TeachPaperless. Welcome! Here's a selection of articles that lots of folks here have commented on and which, I think, will give all you new readers a sense of the type of writing and conversation you'll find on the blog everyday. This is the outline of a five minute verb crunch drill I've been using with my Latin I, II, and III students. You and your kids will need to be comfortable using Diigo, Twitter, & Twitterfall, but the payoff has been great. 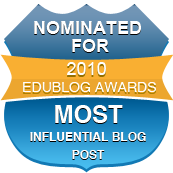 Purposefully refrained from blogging during EduCon this year. Instead, I spent my time in Philadelphia doing lots of one-on-one conversation, listening to a lot of conversations, and thinking about a lot of conversations. In a way, engaging with such a big group of educators gives one a unique opportunity to reflect on one's own practice. 1) We can't just teach kids. We've got to liberate and empower communities. We can't just 'think' beyond the classroom walls; we've got to 'go' beyond the classroom walls. We can't just invite parents into our schools; we've got to go directly into the homes of those we serve in our communities. We have (or could have) the mobile capabilities. We don't need the kids (or their parents) to meet us in one central location. And schools should not be the 'safe' place for kids to go -- that concept is nearly cynical. We need to help empower the residents of communities to make their neighborhoods 'safe' places; and part of the solution -- just like neighborhood cops walking the beat and chatting with folks in their communities and on-call health providers who go into the communities that need help to make house calls -- part of the solution is us teachers being a routine and understanding part of the web of the community on a street-by-street, farm-by-farm, cul-de-sac by cul-de-sac basis. We've got to walk the beat. This, of course, suggests a complete change in the physical and temporal concept of what school is. As usual, I'm always following the most practical route. 2) Teachers are not waiting for the 'okay'. Teachers are just doing it. Will this cause problems? Yes. Will this change the world? Yes. Am I a totally naive idealist? Probably. Does that change the answers to either of the former questions? Not in the least. EduCon gave me a burst of faith in the performative and instinctual goodness of people who love humanity so much that they are willing to give their lives to the service of its children. 3) From a purely personal perspective, I went to EduCon with an experiment: to see how this particular group of progressive teachers would respond to free improvisational music. I left EduCon feeling like I've finally come to understand the one unique thing that I can bring to the community: namely, using free improvisation to help people more closely pay attention to one another, help each other, collaborate, reflect, and build meaning and habits of mind that they can then take out into the work of their lives. I want to pursue this. I want to meet more teachers, more thinkers, more folks who are willing to sit down for a bit and enter into a deeper experience of collaboration. More on this forthcoming as I wrap my own brain around it. So, thanks to Chris and all the teachers and kids at SLA. And peace to all of you who I met there. This community is real, vibrant, alive, and changing the world one school, one kid, one life at a time.